I'm that annoying person who wants you to stop the car, the fork, or whatever you're doing so I can take a picture with my phone. 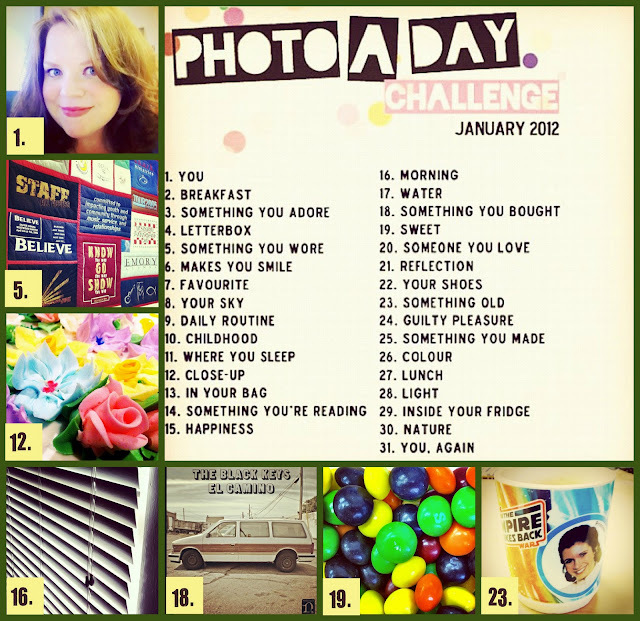 January 2012 has led to even more mobile photography aggression because of a Photo A Day Challenge created by Fat Mum Slim. 1. Telling my story with pictures. 2. Being guided in each chapter of that story. 3. Snooping on other folks as they tell their stories. I'm already being nosy with many of you (thanks for not blocking me) but I want us all to do it. ALL OF US. You can share your pics on Instagram, Twitter, Facebook, your blog, or simply send them directly to my inbox : jamiesrabbits@gmail.com. I'm serious about prying on your life. If you're using a smartphone to capture moments, might I suggest the following apps? Camera+, Snapseed and PolyMagic are my favorites, but every one of my children gets quality attention. Another way to go is simply snap the pic with your camera and call it a day. You'll have to spend all that free time hanging out with friends or sleeping in, but whatever. Comments? Concerns? Suggestions for therapy topics?